Polymer modified, fibre reinforced levelling compound suitable for levelling uneven floors before the laying of floor tiles, vinyl tiles and other sheet coverings. It is imperative that all floors to be levelled must have a functioning Damp Proof Membrane. 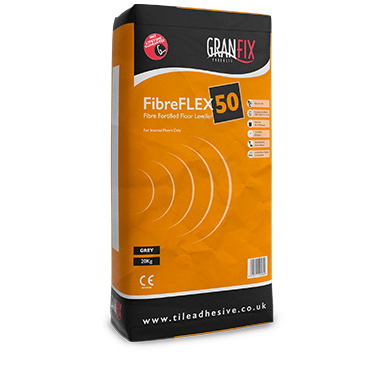 FIBREFLEX 50 can be pump applied for application to large areas. Do not use in areas subject to permanent water immersion. Suitable for bed thickness's from 3mm to 50mm. For internal floors only. Can be used on floating wooden floors.